Welcome to the Graveyard Shift, hosted by everybody’s favorite cryptkeeper, JB! I’ve been watching old Disney flicks with my youngest daughter lately. And I’m talking the old stuff. Robin Hood. Alice in Wonderland. Jungle Book (probably the reason behind my daughter’s new infatuation). It came time to watch The Sword in the Stone, and I honestly wasn’t all that enthused. I didn’t really remember it from my childhood as being particularly memorable. But was I ever wrong. So many entertaining moments that had us cracking up. 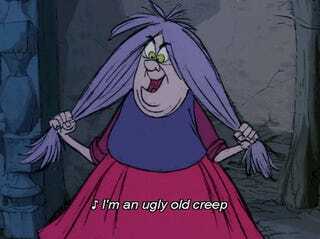 But none quite as good as Mad Madam Mim, who is now probably both mine and my daughter’s favorite Disney villain ever. She’s so funny, so full of herself, and just the most comfortable villain who knows they’re the villain ever. No real topic tonight. I mean, I guess your favorite cartoon villains would work. And as always, have an excellent weekend my fellow TAYers!